You can explore Niagara-on-the-Lake wine country by taking a luxury coach from one of the Toronto's hotels. You will be able to enjoy a relaxing and stress-free day. You can select a time of departure to begin your adventure of tasting delectable wines. You are allowed to use cameras and videos throughout the tour. A tour of Naigara-on-the-Lake is a great addition to your trip while visiting Toronto and the surrounding areas.Visit three of the well-known estate wineries in Canada and learn how making wine takes a certain skill. The first estate winery stop is the famous award-winning Inniskillin Winery and vineyard. Take some time at the tasting room to try some of red, white, or ice wines. Do not forget to cleanse your palate after the tasting so you can taste the full body of the wine. Next, is the Reif Estate Winery sample a little bit of the German heritage in the tasting room. The final stop is at the Pillitteri Estate is the biggest producer of ice wines and Small Talk Vineyards. Each of the wineries have comfortable surroundings to enjoy a tasting glass or you can purchase a bottle to enjoy later back in the hotel room. The oldest wineries were founded in 1970 in the Toronto area. The Reif Estate Winery has roots that go back tweleve generations in German wine making. The Niagara Peninsula has the moderate temperatures and rich soil from Lake Ontario. This right combination produces the best red, white and ice wines in the Toronto areas. You'll find that the Niagara-in-the-Lake wine country has esquiste wines for the palate. While visiting Toronto, discover Ontario's booming wine industry with a day tour of Niagara-on-the Lake. About an hour outside of Toronto on the shores of Lake Ontario lies the quaint town of Niagara-on the Lake and many beautiful, world-class wineries. On this 9.5-hour tour, visit three wineries for tastings with your expert sommelier guide. 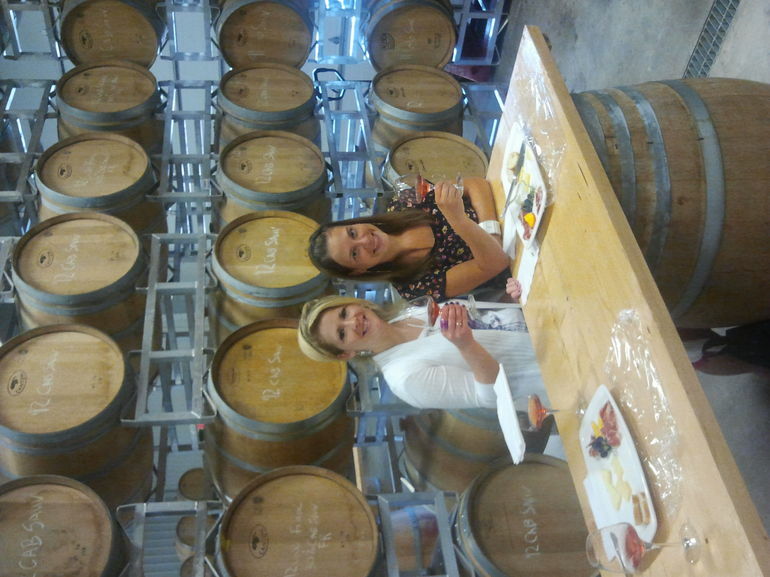 Sample wine with cheese and charcuterie and have free time to explore Niagara-on-the-Lake after your tour. Venture into the idyllic countryside of Niagara-on-the-Lake, the cornerstone of Canada's award-winning wine industry, on this 9.5-hour wine country tour perfect for both wine novices and experts. After pickup from your Toronto hotel, enjoy a scenic 1-hour drive to Niagara-on-the-Lake by comfortable, air-conditioned coach. Upon arrival, leave the coach behind and split into multiple small groups (you will always be in the same group as your friends/family) and jump into a Mercedes sedan or van with your expert sommelier guide, who will be able to answer any questions you have during your tour. Visit three of the region's most popular wineries to sample selections of some of Ontario's finest wines, including its famous ice wine (a dessert wine that is made from grapes that were frozen on the vine). Learn about the intricacies of wine cultivation, including how the terrain and climate come together to create subtle nuances that make each wine unique. During one of the winery visits, delight in a special, complimentary cheese and charcuterie pairing. After your guided winery tour, you will be taken into the charming town of Niagara-on-the-Lake, where you will have approximately 2.5 hours of free time to sample local cuisine at your leisure, stroll along historic streets, and browse quaint shops. Afterwards, rejoin the coach for our return trip to Toronto. The tour operates daily with complimentary pickup available from major hotels in the downtown area. You can also board the tour at the Toronto Coach Terminal (610 Bay Street at Dundas Street).